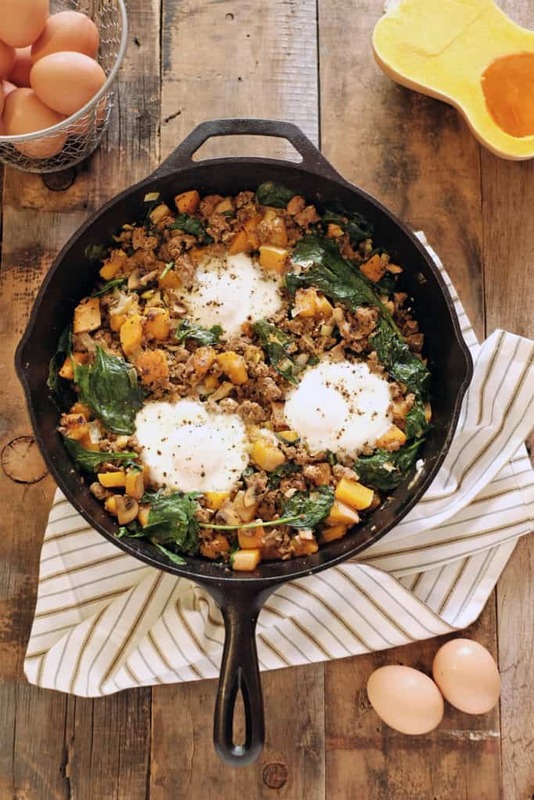 This paleo take on breakfast hash combines the classic fall flavors of butternut squash and rosemary with breakfast sausage and eggs for a savory breakfast that is both nutritious and filling. 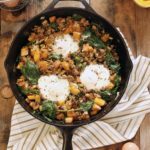 Instead of the usual white or sweet potato hash, this paleo breakfast hash uses butternut squash to give the dish a slightly sweet flavor that pairs well with the savory sausage and runny eggs. It’s easy to whip up a big batch of this hash if you are looking for a unique breakfast to feed a large group and fill up some bellies. No one will leave the table hungry if you put big plate of this hash in front of them. Try this one out the next time you have an extra half of butternut squash laying around – you won’t regret it! 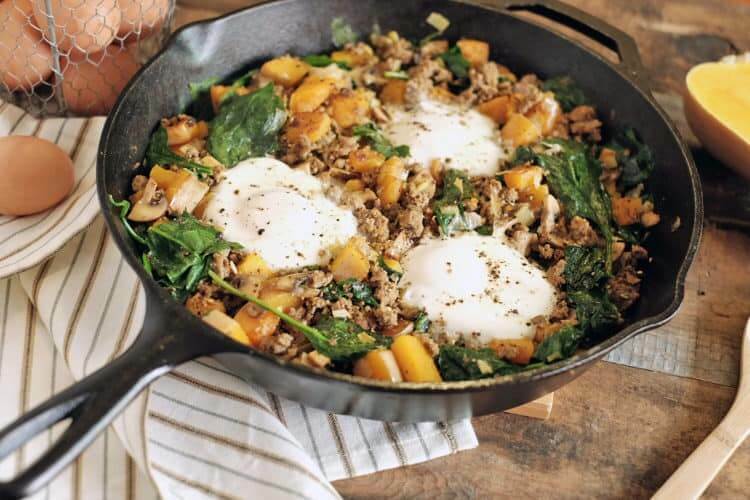 Place a large skillet over medium heat. Once hot, add the sausage into the skillet and break it into small bits. Cook, stirring occasionally, until the sausage is browned and has developed some crispy bits, about 7-8 minutes. While the sausage is cooking, chop up the other ingredients as noted. Once the sausage is browned, remove it from skillet and set aside for later. Leaving the fat from the sausage in the skillet, toss in the butternut squash pieces and cook until it starts to just turn tender, stirring occasionally (about 10-12 minutes). Add in the leek after the squash has cooked for 5 minutes. Next, add in the sausage, mushrooms, garlic and rosemary to the squash and stir everything together. Cook, stirring occasionally for a few minutes until the mushrooms start to soften. Add this spinach and mix in with everything. Cook for 1-2 minutes longer, until the spinach starts to wilt. Next, make small divots in the hash for the eggs. Crack the eggs into the divots and cover the skillet to let the eggs cook for a few minutes. Watch the eggs closely, if you want runny yolks (like I do) you will need to serve them as soon as the whites turn white because the yolks will harden quickly after that. (Alternatively, you can cook eggs in a separate pan to your liking and serve them over the hash). Spoon the eggs and hash mixture onto a plate and serve.